Soft Skull Press, 9781619024854, 304pp. Video stores are dying. But most of you don't care. You've got your Netflix and your DVR, so why deal with VHS tapes or scratched DVDs? Why deal with the grumpy guy at the worn-down independent video store? That grumpy guy is Waring Wax, and he's usually too drunk to worry about his declining business at Star Video, let alone his quickly evolving extinction in popular culture. But everything changes in his small college town when a bright and shiny Blockbuster Video opens nearby: Clearly, this means war. So, Waring enlists the help of his two reluctant employees, charismatic but conflicted Alaura and desperate virgin Jeff, to hatch a series of wild schemes to save their little store. Together, these three misfits try to save Star Video while confronting, among other things, Waring's self-destructive tendencies, a life training cult, corporate bicycle gangs, and a Hollywood director who constantly sees the ghost of Alfred Hitchcock. 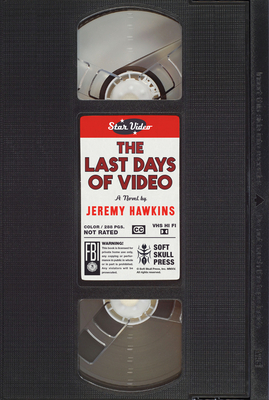 Jeremy Hawkins earned an MFA in Fiction from the University of North Carolina Wilmington. He is the founder and lead editor of The Distillery (distilleryediting.com), a web-based editing service. He is also an independent bookseller at Flyleaf Books and teaches creative writing at the Carrboro ArtsCenter. And of course, he worked for almost ten years at VisArt Video, a family-owned chain of video stores in Chapel Hill/Durham, NC.